Social housing is a vital component of the City’s efforts to mitigate the effects of poverty. An adequately funded social housing system with a well-functioning service delivery model is critical to this work. In 2016, the Mayor’s Taskforce on Toronto Community Housing Corporation (TCHC) found that TCHC was an unsustainable organization, both financially and socially and from an operating and governance perspective. Because of a changing government funding landscape and significant turnover in leadership, TCHC continues to present critical high-risk issues needing urgent attention. 2019 – Recommendations on transferring the TCHC’s 660 buildings in the scattered housing portfolio to non-profit housing providers, co-ops and community land trusts and an updated Shareholder Direction from City Council, which includes a renewed mandate, a stable and sustainable funding model, and key performance indicators for TCHC. 2020 – Recommendations through the Seniors Transition Office on the creation of a Seniors Housing and Services Entity, addressing how the City will better integrate services for seniors, including the TCHC seniors housing portfolio. Under the authority of the provincial Housing Services Act, the City of Toronto is the service manager for over 240 social housing providers, including TCHC. TCHC is home to some of the most vulnerable and marginalized residents in the city. It is the largest social housing provider in Canada and the second largest in North America. TCHC has 2,100 buildings that are in 106 of Toronto’s 140 neighbourhoods and provides housing to 110,000 low and moderate income residents. TCHC does not have the mandate, expertise or funding to offer all the supports that tenants need. TCHC is not financially sustainable in its present form. TCHC’s buildings need substantial new investment to replace ageing mechanical systems, roof and other major capital features. TCHC had a tumultuous five years from 2010 to 2015 with three Boards of Directors, four CEOs and significant turnover in senior management. In response, the City established the Tenants First Project Management Office, housed in Social Development, Finance and Administration (SDFA), which works in partnership with other City divisions including Shelter Support and Housing Administration (SSHA). Tenants First is working to transform TCHC into a social housing landlord whose buildings are in a good state of repair, and who connects tenants to appropriate services so they can participate actively in their communities. To this end, the City has developed an interim funding model for 2018 and 2019 to cover the operational, capital, and development shortfalls for this period. The creation of a new Seniors Housing and Services Entity directly accountable to City Council and responsible for management of 83 seniors-designated buildings (over 11,000 units) currently within TCHC. Initiating a process to redefine core components of TCHC’s business to focus the organization on its role as a social housing provider. Adequate funding for both a TCHC and the proposed new Seniors Housing and Services Entity. Creation of a plan to transfer the scattered housing portfolio to non-profit housing providers, ensuring continued affordability. The City’s work to transform TCHC will continue for the next several years. The Tenants First Project Management Office is leading a process to review TCHC’s core business, develop a permanent, sustainable funding model, and revise City Council’s shareholder direction to TCHC and operating agreement as required. This work will include reviewing TCHC’s current lines of business and making decisions about how TCHC will manage its business in the future. It will also be informed by lessons from three Tenants First TCHC pilots that began in 2018. In response to City Council direction, a much closer City – TCHC relationship has evolved over the past several years. 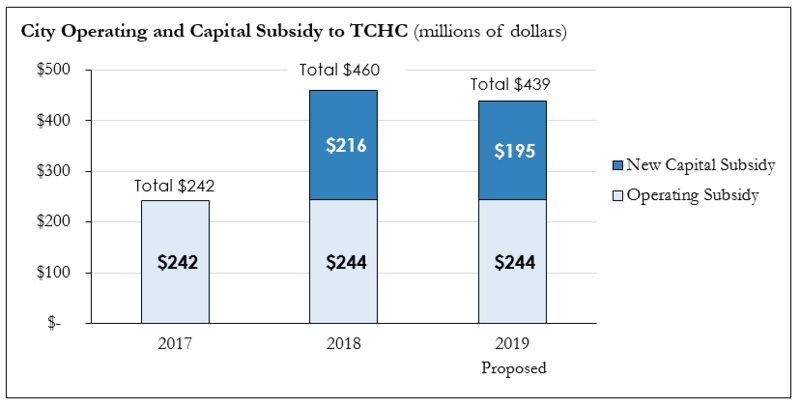 TCHC now receives more funding and is more accountable to Council, engaging directly in the budget process rather than as a part of the SSHA budget. The City, through Tenants First, has been more involved in the operations of TCHC.